The ES has never been regarded as one of the automaker's prettier vehicles. 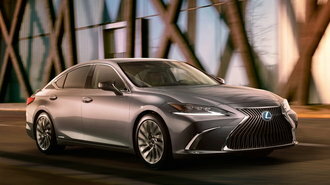 Lexus tried to give the sedan some pizzazz back in 2013 with the addition of its controversial spindle grille. This time around, Lexus really wants to emphasize the design aspect of its luxurious midsize offering by giving the vehicle some exterior cues from the new LS flagship. The super-slim headlights with the check-mark-like daytime running lights look similar to the units found on the LS. Lexus' massive spindle grille makes an appearance on the new model, as well, which is to be expected, as it's on everything the automaker sells these days. The grille, though, features metallic accents that are also found on the air intakes — a nice touch that ties the front end together. Lexus didn't provide high-quality pictures of the entire vehicle, but did release a video where we briefly get to look at the rear end. There's a prominent rear spoiler, hinting towards the athletic performance part of the the automaker's claim. The current ES is available in a couple of powertrains, including one gas and one hybrid variant. We expect Lexus to offer, at the very least, the same amount of powertrains in the new vehicle. All-wheel drive is rumored to find its way to the sedan, as well, as the current generation is only available in front-wheel drive. With the rumored death of the Lexus GS and the decline of sedans in general, the seventh-gen ES could serve as the middle ground between the entry-level IS and range-topping LS.